Content on all things George Washington soccer. It seemed like it was going to be one of those days when everything went right for GW when Ranalli blasted the ball into the back of the net not five minutes into the game. The home Colonials seemed in control, but a goal in the 23rd minute revitalized the Robert Morris Colonials, whose attack could not be stopped until the last fifteen minutes of the game. RMU controlled possession and wouldn’t give GW a moment of rest. Head Coach Craig Jones had to say of his team’s performance, “The issue that we have right now is teams are not beating us, we’re beating ourselves by giving away goals.” That was no exaggeration. The Colonials have been outscored 9-3 in their last four games, which Coach Jones attributed to mistakes on the defensive side of the ball. The defense seemed out of sync and was sluggish to get back in transition. However sloppy they were, GW was able to prevent Robert Morris from taking the lead until the 74th minute, when the Colonials defense gave up the ball just twenty yards from the goal, and RMU senior Brett Neco scored for the second time, beating GW sophomore goalkeeper JP van der Merwe with a shot to the bottom left corner of the goal. “Basically it was a tactical error on the first goal… and an error by myself, too, that gave up the other goal,” van der Merwe said of the team’s defending after the game. The team’s major concern seems to be improving their defense. The hot afternoon sun certainly didn’t make the Colonials feel any better, and both sides were getting verbal and physical, with each team meriting a yellow card in the final ten minutes of play. Despite their struggles throughout the game, GW was able to press hard in the last fifteen minutes of the game to try to equalize. They were able to create several chances, but could not put the ball into the back of the net. “We’ll do our due diligence in terms of the scouting reports and put together… an eleven on the field… that can get us some results,” Coach Jones said of his team’s preparations for their A-10 Conference opener at Dayton on October 11. That is the next time the GW Colonials will take the pitch, looking to improve on their 3-6 record in nonconference play. WASHINGTON, DC – Senior captain Tyler Ranalli set the tone early and often, netting a career high three goals and leading the Colonials to a 4-0 win over the Virginia Military Institute Keydets Saturday afternoon from the Mt. Vernon Field, improving to 3-2-0 on the season. Ranalli stole the ball from a VMI defender and continued to slip a shot past the sliding keeper to give the Colonials a 1-0 lead in the second minute. The game then settled in, with GW controlling more possession and creating more chances than their opponent. Meanwhile, the back four for the Colonials held strong, allowing only one shot on goal and contributing to the third shutout of the season for the team. Thirty minutes in, goalkeeper JP van der Merwe played a big ball from the back, which six-foot-five sophomore Philip McQuitty flicked into the path of a cutting Ranalli who beat the keeper in similar fashion to his first goal. The Colonials held out for the rest of the half, which became progressively more physical. Fifteen total fouls and a yellow card for a VMI’s Ripa Santo. This trend continued into the second half which brought two more yellow cards and plenty of hard fouls. The Colonials won the physical battle, gaining an advantage on head balls and not giving VMI’s players a chance to breathe let alone shoot; the Keydets managed only four shots in the game. This is a tribute to the organization and teamwork of the defense. Early in the second half, Ranalli spread the wealth. He played a low ball to junior Farhan Khan at the top of the eighteen; Khan beat a defender, and finished with a strong left-footed shot to the top left corner of the net. The Colonials had a firm grasp on the game at this point, but Ranalli still owed us one more goal. It came on a cross from freshman Angel Valencia which Ranalli finished with a sliding effort to complete his hat-trick. “Each game, we’re getting a little better in every area,” said 2nd year Head Coach Craig Jones, looking ahead to the direction the team is trending. The Colonials will look to ride this momentum to victory against St. Peter’s in Jersey City on Wednesday, before coming back home to play Navy for the “Kickin’ It on The Vern” game on Saturday. The Colonials applied pressure and controlled the pace-of-play from the opening whistle en route to a 4-1 Senior Day rout of the Saint Louis Billikens on Sunday morning at Mount Vernon Field. The start time for the match was moved from 1 p.m. to 11 a.m. because of the threat of Hurricane Sandy along the Eastern seaboard but this earlier-than-normal start time had no ill effects on the Colonials play as they dictated the tempo of the match despite being outshot 16-11 by the Billikens. Entering the match, the Colonials had scored only one goal in their previous five matches but scoring did not prove to be a problem on Sunday. Sophomore Nicole Belfonti got the Colonials’ scoring started 19 minutes into the match when she received a nice crossing pass from senior Molly Bruh and put it in the back of the net. Adrianna Moya added to the Colonials’ lead 12 minutes later when she scored off a nice pass from Kristi Abbate. GW continued to apply intense pressure, leading to a controversial play in which Molly Bruh unleashed a strike from 30 yards out that deflected off the crossbar. The ball appeared to have been kept out by Saint Louis goalkeeper Katie Walsh but after a scuffle in front of the net for the ball, the side referee ruled that Bruh’s initial shot had caromed into the net, extending GW’s lead to 3-0. Alex Neal would round out GW’s scoring for the day with 24 seconds left in the first half when she took a pass from sophomore Taylor Katz and scored to stifle the little momentum the Billikens had built up in the closing minutes of the half. In the second half, the Colonials were able to play a “bend-but-don’t-break” style of defense that allowed them to control the ball and run valuable time off the clock, thwarting any chance of a Saint Louis comeback. GW conceded their lone goal of the afternoon 15 minutes into the second half when Billikens’ forward Lindsay Elking unleashed a shot from point blank range that beat the Colonials’ freshman goalkeeper Nicole Fasano. It was an especially emotional win for the Colonials’ four seniors, Molly Bruh, Adrianna Moya, Samie Cloutier, and Kayley Sullivan, who were honored before the match. Furthermore, this victory will serve as an important momentum builder heading into the offseason. With the victory, the Colonials closed out their 2012 campaign with an overall record of 5-12-1. Sunday’s win was GW’s first and only Atlantic 10 conference win of the season. Nicole Fasano has all the marks of a spectacular athlete. She lays her body out and leaves everything on the field. In the Friday, October 26th game she made great saves including two diving saves and left nothing to be ashamed about in the George Washington University’s Women’s Soccer team’s stunning defensive game. 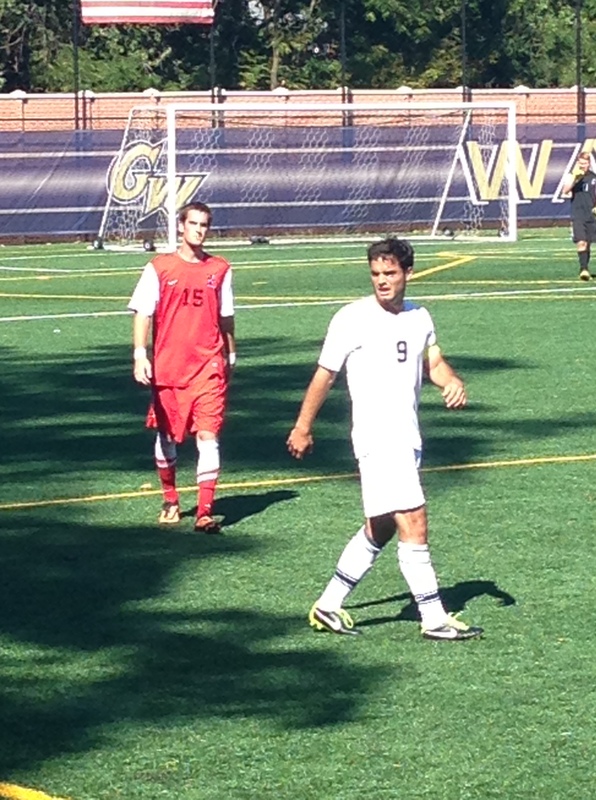 Despite their best efforts, GW fell to Butler in a 1-0 loss. GW kept defense strong until the 75th minute and finally gave up a beautiful goal to Randi DeLong of Butler. This marks GW Woman’s Soccer team’s eigth consecutive loss of the season with only one regular season game left to play. Highlighting the defense, not only did Nicole Fasano have a great game in goal, Alex Brothers, Alex Neil, Jane Wallis, Samie Cloutier, all had fantastic games, keeping the energy of the defense up and coming at every play with intensity shutting down the infamous Sophia Maccagnone, the freshman leading goal scorer of Butler’s team. GW Women play their senior game this Sunday at the Mount Vernon campus against Saint Louis.